여러 세포에서 생산되는 small extracellular vesicles의 일종인 exosome은 암을 비롯한 여러가지 질환에 대한 바이오마커로써 기초 연구 및 제약 분야에서 중요한 연구 대상으로 각광받고 있다. Capturem™ Exosome Isolation Kit (Cell Culture)는 기존의 antibody based isolation 방식이 아닌, proprietary exosome-binding compound와 Capturem™ 기술을 결합한 혁신적인 제품으로써, 세포배양액 (cell culture media)으로부터 30분 내에 exosome을 분리할 수 있다. 본 제품은 large cellular debris를 제거하기 위한 “Exosome Ioslation Pre-clearing column”과 exosome을 결합하고 분리하기 위한 “Capturem™ MaxiPrep Exosome Isolation Columnes (Cell Culture)"를 포함하고 있으며, 이 column은 모두 초원심분리기 (ultracentrifuge) 없이, 기존의 benchtop centrifuge에 사용 가능하다. Maxi-prep size (50 ㎖)의 Exosome isolation columns를 이용하기 때문에 한번에 25 ㎖의 cell culture media를 적용할 수 있다. 또한 본 제품은 프로토콜에 최적화된 wash buffer와 elution buffer를 포함하고 있다. 그림 1. Cellular uptake of exosomes in HEK293T cells. 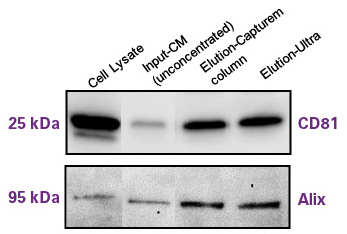 Isolated exosomes from the Capturem kit, ultracentrifugation, and input CM supernatant were labeled with PKH26 dye and uptake studies carried out as described in Methods section of the technical note. The percentage of total yield required for cellular uptake assay is displayed to provide a comparison of the yield differences between the two methods. 그림 2. Enrichment of exosomal markers CD81 and Alix in Capturem-isolated exosomes. Western blot analysis of CD81 and Alix as per the protocol described in the Methods section of the technical note. The band densities were calculated using Image Lab software. 그림 3. Quantitative determination of yield and mean size of exosome isolated through different methods. NTA data showing concentration (Panel A) and size (Panel B) of precleared CM (input) and isolated exosomes (yield) from HEK293T cells using the Capturem kit, precipitation reagent (Competitor T), and ultracentrifugation. The isolation methods are described in the Methods section of the technical note. The exosomes were isolated from 10 ml of precleared CM supernatant for each method. The total exosome yield was divided by input volume to obtain yield (particle/ml of input). 그림 4. NTA data of isolated exosomes from HEK293T cells using the Capturem Exosome Isolation Kit (Cell Culture). Panel A. Size and particle concentration distribution plot of exosomes from HEK293T cells (peak at 95 nm). D90 value is shown. Panel B. Three-dimensional graph illustrating size versus intensity (relative frequency of each size range in the eluted sample) versus concentration (particles/ml).